Please remember what I stated in a previous article (HERE): “There is really no such thing as a muscle being “toned” or “untoned”. Muscle is simply muscle. Sure there are some people with bigger muscles than others, but if you are not toned, all that means is you have a layer of fat covering up your muscles. So in order to get toned, you need to work on building muscle and losing fat.” When I reference “toned” in this article, keep that in mind! These individuals spend hours doing long cardio, do thousands of reps with very light weight, then to make matters worse they drastically cut the calories their bodies are needing. This kind of training and lifestyle does not lead to getting toned muscle but will lead to no muscle. When you do hours of long cardio each week, your body will eventually start eating away at your muscle. When you are trying to get your muscles toned, the last thing you want is for your workouts to burn your hard earned muscle, right? Have you ever wondered why marathon runners look the way they do? They spend hours running each week, and as a result have very little muscle. A sprinter on the other hand is a different story. Their workouts consist of short bursts of energy, followed by rest and repeating. Instead of using muscle as fuel for their workouts, they are using fat. Plus, they are boosting Growth Hormone and Testosterone which both contribute to putting on lean muscle mass. Next, let’s take a look at the high rep with low weight dilemma. In the past, we discussed the difference between high reps vs. low reps so if you need to go back and reread that, please do so. When you look around the gym at those trying to get “toned,” one main problem you see is that they are not challenging themselves during their lifts. They simply think that if they do 30 reps of an exercise and “feel the burn”, that they are getting “toned”. The more lean muscle you have, the less fat you will have, leading to an incredibly toned body. If you think that doing 25 dumbbell raises is going to get your arms toned, you have been misled. Stick to doing 6-12 repetitions and 3-5 sets per exercise. Push your body each time you lift to ensure you get stronger. The stronger you are, the more lean and toned you will be. The one time you should do higher reps on exercises is when doing body weight workouts. Because it is just your body weight, the best way to challenge yourself is by doing more and more reps each time you go to the gym. Finally, we often hear people talk about how little they are eating in order to get “toned”. This one absolutely kills me! When you are not giving yourself enough fuel (calories), your body will start eating away muscle and start storing fat. Simple as that. When you are eating the right foods, there is no reason why you should be drastically cutting calories. Food is there to allow your body and brain to function properly. When we workout, we need food to refuel our muscles so they can recover, grow, and get stronger. Don’t fall into the trap of thinking that you need to cut out all these calories in order to get “toned”. Eating the right foods (and eating when you are hungry and until you are satisfied) and engaging in the right workouts will get you toned faster than you thought possible. 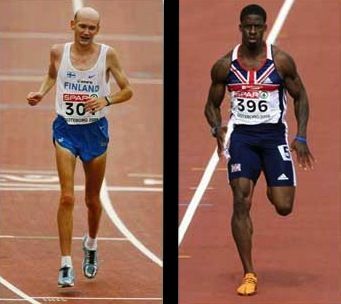 Therefore, start training like a sprinter. Get strong, powerful, fast, explosive, … We all have it in us. It is simply about doing things the right way! Next, we can see that getting toned is about getting strong. The stronger you are, the more lean muscle you will have and the less fat you will have. This all leads to you being more toned! Finally, don’t go on some fad low calorie diet. Eat the right foods and lots of them. Allow your food to work for you by eating properly. When you follow a solid nutrition plan, you will naturally burn fat off. Combine that with proper workouts and you will be well on your way to the results you have always dreamed of. Getting toned is simple when you have the right information in front of you. It will take hard work and dedication, but it will be worth the effort when you start seeing results within weeks! P.S. Like this article? If you could, take 1.7 seconds and hit the ‘Like’ and Tweet button for me before you go!